She's come all long way since then! Oh, and for anyone who wondered, she is most certainly a pet! LOL, given the previous shot of Rhoda, I'm so glad she's closer to the egg than the pot pie! Congrats on a great shot. I love this photo but for more than photographic reasons. I used to have a pair of Rhode Island reds which looked just like this one. Great portrait of a sentimental bird. This is really beautifully lit. Would you please share the lighting setup (or a setup shot maybe). Also, what did you use for a background? Message edited by author 2008-03-06 15:39:39. Love the colours. It looks 'Old World'. One nit pik though, I wish the feet weren't cut off. Congratulations!! Great shot, love the PP. Congrats on the ribbon. Just a great chicken pic! (and yes, our chickens were all pets too, as were the turkeys, the guineas, the ducks, etc, etc. The background accents the color of the bird perfectly and the pose is definitely a good capture. I'm not big on boarders but it is definitely used correctly in this picture. Well done. Message edited by author 2008-03-03 20:51:29. Congrats, Shawn! This was one of my 10's. A question for you...what are you using as a background? A backlit burlap sack? Whatever it is, it works really well. This shot is beautiful. So is Rhoda! Congratulations! Awwwwwwwwwwww she's grown so much! How cute!! Congrats on the ribbon!! I love bird shots, this is just great! Congrats! Congrats on your very well deserved ribbon, Shawn. What a beauty Rhoda has become! Big congtrats on the ribbon! Gratz on your 2nd ribbon and also for the 2nd highest score with the 77mm f1.8 limited. mad shawn .. its great to see that rhoda survived the pie !! congratulations on a brilliant photograph and a ribbon .. This was my winner...glad you ribboned and thanks for sharing the other image and the story...great work! Congrats. Fantastic color and lighting! Stunning portrait, I LOVE the colours. Big congrats on your ribbon, Shawn. Was so pleased to see this ribbon, it's such an incredible shot!!! 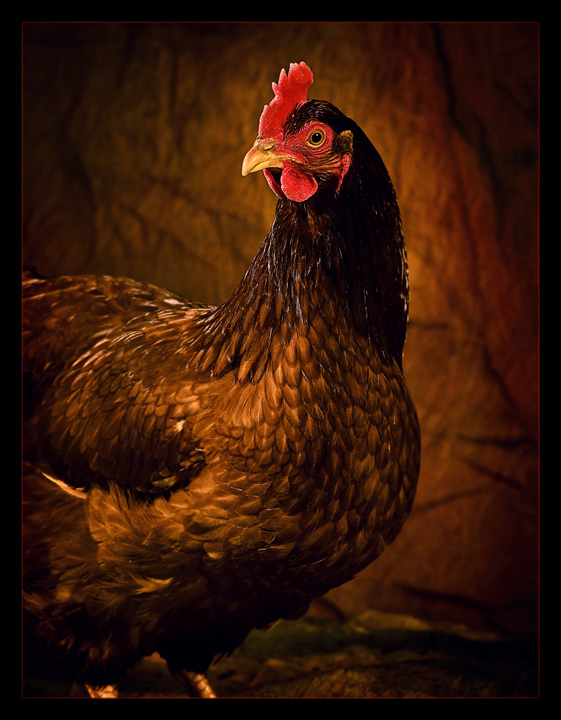 Man I love a great chicken shot, with or without a ribbon, superb portraiture! I've been trying for a while to get a decent shot of a friend's "exotic" chickens, bur haven't been able to get one to hold nearly still enough. Well done! This is such beautiful processing. I love this photo. Congratulations on your prize :)! You certainly "plucked" this ribbon out of a hat. The concept and the image are outstanding. That's a healthy looking hen BTW. Is this Rhoda, Lefty, or yet another chicken? Terrific shot, and the title's hilarious. Congrats on the ribbon! Thought the details in the feathers was fantastic. Great Shot. If only you had gotten the Rooster's full body in the shot, it would have been a 10 for me. Nice job anyway. I'm not sure I like the crop, but the vividness and sharpness are fantastic. Pet? I'm a city girl, I never thought of this. Fantastic shot. 8 - Very nice. Like the 'flow' in the shapes of the feathers. Nice background and lighting. Framing works well. Up to 8 from 7. Great picture of a chicken, colors are warm and rich. Nice textures, I like the lighting as well. Wow. Light, tones, detail - all awesome. But it's the pose that seals the deal. Gorgeous tones, perfect bg and the pose is regal. Excellent capture. Wonderful color and texture choices. The background mirrors the feathers perfectly. I love the rich, golden brown tone of this picture. Beautiful capture of all the layers of feathers. love the color of this .simple but very nice well done. A nice example of color on color and a good-looking bird. Nice detail and lighting overall, though missing detail in the shadowed part of the bird. Not sure what I think of the crop; it seems a little off to have part of the legs but no feet and the crop going through the body and wing somewhat randomly. Nice job with color on color, the subject stands out despite being similar in color to the back drop. Unique pet, nice change from the dogs and cats. I don't know that I'd like having a chicken (or is it a rooster) as a pet, but I sure would like to be your pet if you can make a portrait as nice as this, haha. It's an excellent portrait. Oooo, I do love a good rooster shot. Very well done! My sister had a pet chicken. Nicely done. Great shot! Love the colors. But how did you get one of my chickens? Nice tones. And nice border, too. Wow, How did you make that thing hold still? Proudly hosted by Sargasso Networks. Current Server Time: 04/19/2019 12:23:36 PM EDT.